Max Lucado’s promising premise gets sidetracked by a strange need for too much niceness and a perfect ending. 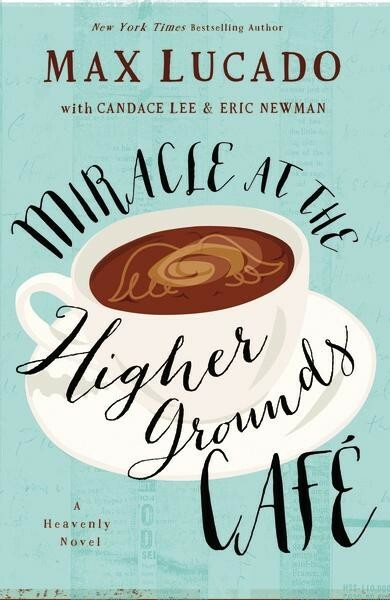 I remember getting a free pre-published copy of Miracle at the Higher Grounds Cafe at a writer’s conference I went to a couple of years ago, and reading parts of it.1 I finally got a regular copy, and read through it, and here are my thoughts about it. Chelsea Chamber’s marriage is falling apart, and while her mother has left her coffee shop to her, she left a lot of debt for her, too. Things are looking grim, until an angel in disguise shows up, and then a strange device is put in for her cafe’s internet server. This device allows internet access to only one page, but it’s a page where anyone can ask God one question, and God responds to them. Reviewing a Christian book is a bit more intricate than reviewing a book whose author doesn’t claim that it is a Christian story. I can’t consider it enough to look at just the story, but I have to consider the theology that is contained in the story. The premise is that a woman is trying to get on with her life after her husband has an affair and blows through millions of dollars. This could have made for a very interesting story. As it turned out here, though, it simply fell flat. Perhaps the main thing wrong with this book story-wise could be summed up this way—the writer took few, if any, risks. The story proceeds in expected ways, there is little sense of real conflict or peril. The book’s one “bad guy” is smarmy and snippy but that’s about it, the one big crime turns out to be hardly much of a crime at all, and the one big moment of peril is done in such a way that no one seemed to be in much danger. It’s one of those books where everything is almost idyllic. The coffee is perfect, the baked goods are delicious, the two people Chelsea hires during the story are ideal (not counting the one working there when the story begins and then quits a couple of days later), the elderly guy who lives across the street can fix almost anything and knows all the answers, even the estranged husband is almost perfect once he shows up personally in the story. True, there is the occasional espresso machine that breaks down, or the tax debt, or the Realtor guy who’s a bit two-faced, so things aren’t perfect, but they are hardly deathly serious, either. Maybe the best sign of this lack of risk is what I call the God-bandage. This is where Chelsea has her big crisis towards the end of the book, Manny gives her the big tour of her life, and things all turn out all right because … well, because, God. After Manny shows Chelsea how God has always been with her, Chelsea’s problems seem to evaporate. She’s able to pay off the debt she inherited from her mother, her cafe gets rebuilt and reopens, and things even improve between her and her husband. It’s not so much that an ideal ending is a problem, but it’s simply how it came about. For example, Chelsea had good reason to have bad feelings towards her husband, he’d had an affair and then broken a promise about some money they were saving. Whether or not she always expressed her anger towards him in the best ways, her anger and hurts towards him were justified. And there reconciliation seems to happen without them really dealing with those issues. The book treats her hurts as if God is some kind of bandage that covers them over and makes them all better. Since I’ve brought up how God is used in this story, I guess I’ll go over to the second part of this review. In many ways, the fluffy theology of this books fits the thin story, and we might wonder which is the cause and which the effect. Here is an example of some of the things the author has God saying through the God Blog. “Hang out with Matthew. He just wants your attention. You might be surprised at how much he longs to spend one-on-one time with you. And now that I’ve mentioned it, the same applies to me! Hope to speak with you soon. Love, God.” (p. 60). In the big climactic moment at the end of the story, the angel Manny takes Chelsea on a tour of her life. “With Manny as her guide, Chelsea journeyed through memory after memory. Every moment of loneliness, abandonment, and heartache was revisited. Redeemed.” (p. 171). And this scene ends with Manny taking her to Christ’s crucifixion, and here is what he tells her about it. “This is the loneliest point in history. The last moment of true abandonment. From here on, abandonment is nothing more than a myth. And loneliness? A choice.” (p. 173). “There is no separation. There is no chasm between you and the heavens. There is no divider, no veil between you and God’s love.” (p. 173). There are times when my own words don’t seem to do as well as those of others to explain something. Let me use someone else’s words to show what I mean by calling this author’s theology fluffy. Horton is writing about another minister in this next quote, but what he says is eerily applicable to the message of this book. The God of the God Blog is little better than a lonely grandpa who just wants the kids to be happy and to remember to come for a visit every now and again. Any sense of God’s grandeur, transcendence, and holiness is lost. To borrow Horton’s analogy, the God Blog puts God on the counselor’s couch, and makes him an object of pity. And what is done to the crucifixion is as bad. The divine sacrifice that saved us from our sins is made into a therapeutic event that keeps us from being lonely. We are redeemed from our feelings of loneliness and heartache, but redemption from our sins is not ever really mentioned. This isn’t nit-picking. As the story tells us, Chelsea was pregnant when she and Sawyer were married. During the story, Chelsea has two outbursts of temper that prove to be unfair towards the people she was angry with. There is also her act of petty revenge against the book’s one bad guy. In other words, Chelsea is a sinner. There may be a time for her to know the truth of Jesus’ words “I will never leave you nor forsake you,” but she also needs to know that Christ died for her sexual sins, her bad temper, her lack of faithfulness to God, and all other of her sins. Manny gives her the therapeutic comfort, but neglects the more important comfort of the most important reason why Christ died. My problem with the story isn’t that it’s a lite novel, but that it’s trite. It raised serious issues (marital infidelity, financial irresponsibility), but then doesn’t really deal with them. It merely applies a God-bandage to make the bad feelings go away. And the theology doesn’t help things. If one could compare the story to a cupcake, nice and sweet but not very substantive or nourishing, then the theology is little better than a fluffy filling. The God of the Higher Grounds Cafe is a rather sad creature, lonely and desperate for us to talk with him, a being to be pitied more than worshiped and trusted. I simply can’t recommend this book. Wow. Thanks for the review. I can understand what you mean about lite vs trite. There’s nothing wrong with a light (or lite) read as long as there’s something to hold on to that gets you to the end. Thanks. Lite reading is fine, but you’re right, it helps for it to have some substance, too.